After reportedly realizing over the course of her deeply uncomfortable trip to the US that Ivanka Trump was an unavoidable backchannel to the West Wing, German Chancellor Angela Merkel invited her to speak at the W20 Summit in Berlin on a panel about women’s entrepreneurship. The audience did not love it. 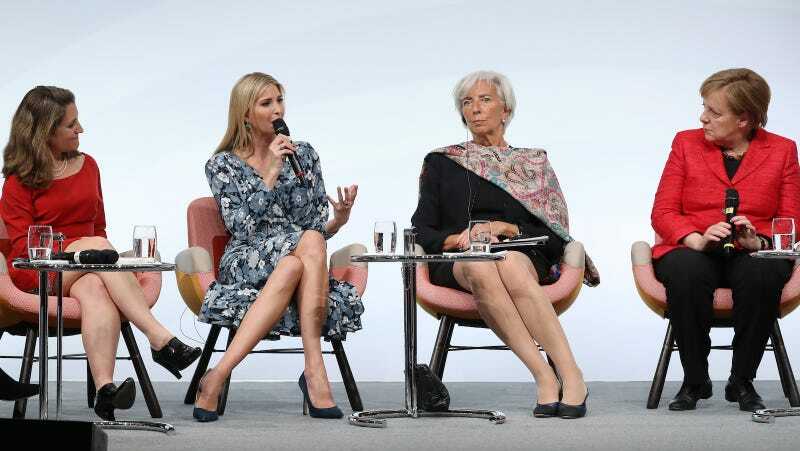 Ivanka, Politico reports, was questioned bluntly by the panel’s moderator and was “booed and hissed” by the room of mostly women when she called her father, hilariously, “a tremendous champion of supporting families and enabling them to thrive.” Looks like we’re going to war with Germany now! Trump described herself as a “feminist” during the panel, and when questioned about her father’s “attitudes towards women,” she dismissed the notion as a concoction of the media. And during the panel, Ivanka again reframed this privilege, this time implying that her limitless existence is somehow a result not of massive piles of cash but in fact her father’s own inherent goodness; or rather, that said cash is perhaps the natural result of her father’s inherent goodness.